NEW ONGOING SERIES! One is a decrepit mob of gurgling, ravenous fiends...and the other is a zombie outbreak. When there is no more room in Hell, the undead shall take over Comic-Con! A crew of feuding best friends find themselves trapped inside Americas largest comic convention transformed into a seething cauldron of zombies. Is a horde of starving brain-eaters any match against reflexes battle-hardened by video games, nerves tested by horror flicks, and courage crystallized by comic books? 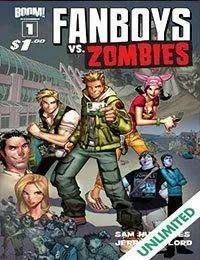 Find out as an unlikely band of nerds use their genre savvy to survive in Fanboys vs. Zombies! Written by indie sensation Sam Humphries (Our Love is Real) with art by hot new talent Jerry Gaylord!